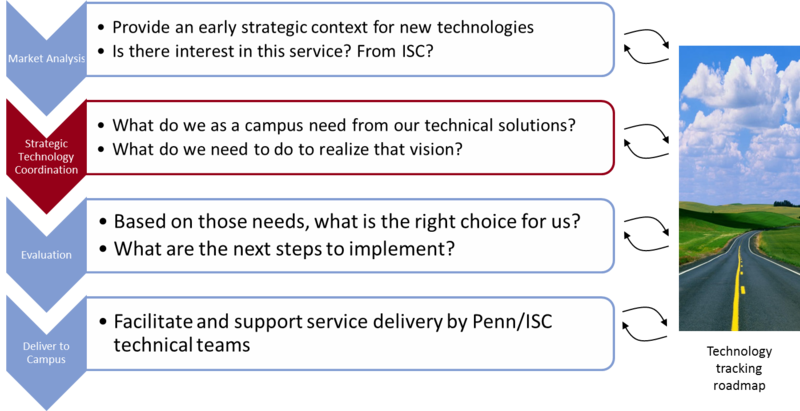 The mission of the Strategic Technology Coordination process is to increase the consistency and transparency of IT solutions at Penn by collaborating for long-term architectural planning. Drawing upon a wide selection of experts from across the campus to form working groups, we explore new and impactful technologies, processes, and services as well as provide strategic recommendations on solution adoption, consolidation, and alignment. Building on the deliverables from this process, future solution evaluations and implementations can achieve more timely and consistent results. Strategic Technology Coordination is a part of our broader strategic planning process. Learn more about our portfolio and how new initiatives are selected. For more information, contact the co-leads, Bryan Hopkins and Joe Cruz.